Transitioning to Angular 2 from Angular 1 also known as AngularJS, the Google supported open-source web application framework, is not so much about upgrading as moving to something different, according to experts. The differences between the two frameworks were explained in a Visual Studio Magazine Q&A with Ted Neward, who is director of Developer Relations at Smartsheet.com and well-known as a presenter at Visual Studio Live!. Basically, Angular 2 is a complete rewrite of Angular 1, the framework formerly known as AngularJS. It seems AngularJS had issues. While there has been resistance among AngularJS/Angular1 coders to adopting the new improved plain ol’ Angular, upgrading seems to be the wisest career choice. Leaving your software using the old version of a library is Just Not Done. Because Components are the way of the future and the future is awesome. I don’t want to fall behind. I don’t want to be stuck holding the bag (and 100k lines of code) when they deprecate the old one. If I don’t know the newest thing then no one will hire me. From a practical I-need-a-job standpoint, the last bullet may be the strongest reason to move into the new Angular world. Also the component approach in plain ol’ Angular is a big deal. Bookmark the Angular CheatSheet on the Angular Web site. Learn and master the TypeScript language. 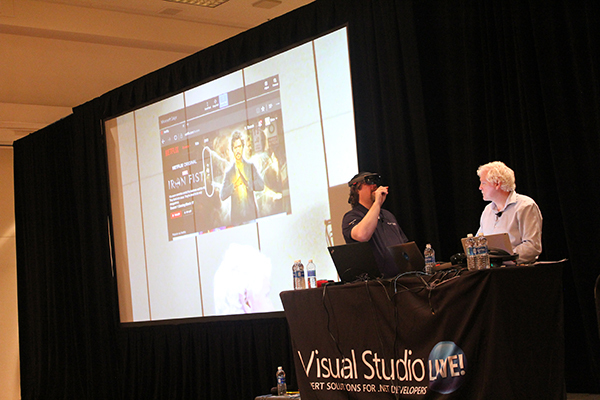 He also pointed to Visual Studio Live! sessions on Angular. Whenever an app is running, you need to know what’s happening behind the scenes. And whenever an app crashes or otherwise has trouble, you definitely want to know what’s going on. Logging is the simple, yet critical, way to ensure your apps are doing what they’re supposed to be doing. Logging helps you detect and identify any issues. Now that ASP.Net Core is open source, and cross-platform, building in and linking logging functions is more straightforward than ever. The logging API in ASP.Net Core supports for a whole bunch of logging providers. You can send log details to one location or several locations. You can also connect to a third-party logger. And it’s straightforward. Notice I didn’t say easy, but it’s certainly straightforward. Thankfully, as is often the case, there are several blogs ready to help out. “ASP.NET Core supports a logging API that works with a variety of logging providers. Built-in providers let you send logs to one or more destinations, and you can plug in a third-party logging framework. This article shows how to use the built-in logging API and providers in your code. To create logs, get an ILogger object from the dependency injection container. This example creates logs with the TodoController class as the category. Categories are explained later in this article. ASP.NET Core doesn't provide async logger methods because logging should be so fast that it isn't worth the cost of using async. If you're in a situation where that's not true, consider changing the way you log. If your data store is slow, write the log messages to a fast store first, then move them to a slow store later. For example, log to a message queue that's read and persisted to slow storage by another process. This tutorial takes you through the whole process of setting up logging for all different versions of ASP.NET Core. It also provides code snippets and listings pf third party loggers you can connect with ASP.NET Core. You’ll find this tutorial requires some familiarity with ASP.NET and ASP.NET Core, but does a comprehensive job of walking you through the process. Blogger Nicolas Blumhardt provides a clean, well-organized tutorial on incorporating Serilog with ASP.NET Core. He also supports his statements with code snippets. “You don’t need anything special to use Serilog with .NET Core: the Serilog package works the same way across the .NET Framework and .NET Core on Windows, macOS and Linux. If you are writing .NET Core web apps with ASP.NET, you’ll want to plug into the Microsoft.Extensions.Logging subsystem to receive events from the framework: unhandled errors, diagnostic info from the request processing pipeline, events from EF, and so on. Not to get carried away, but improvements are happening. Not at warp speed but not at glacial speeds either. "The first way that most developers learn how to debug is to sprinkle console.log commands throughout their code, in order to infer where the code is going wrong," states the introduction to a tutorial on Google DevTools. In the tutorial he demonstrates how to set breakpoints in DevTools, which Google says "lets you pause in the middle of a page's execution and step through the code one line at a time. While you're paused you can inspect (and even change) the current values of variables at that point in time. You may find that this workflow helps you debug issues much faster than the console.log method." Besides the video, Google provides step-by-step text instructions illustrated with screenshots to help you experiment with the Google way of debugging. The tool is embedded in Firefox, but developers who want to run it as a standalone web application for use on code running in other browsers can find out how to do that at the GitHub repository for the tool. At a recent Visual Studio Live! conference, Microsoft's Matthew Soucoup demonstrated pairing his Visual Studio project to an iPhone for live debugging, as reported in a recent Visual Studio magazine article. Several people in the audience asked if you still need a Mac computer for iOS development and the answer was yes, although there appear to be plans to make it all possible from a Windows machine. Xamarin continues to be the hot toolset for developing cross-platform mobile apps. 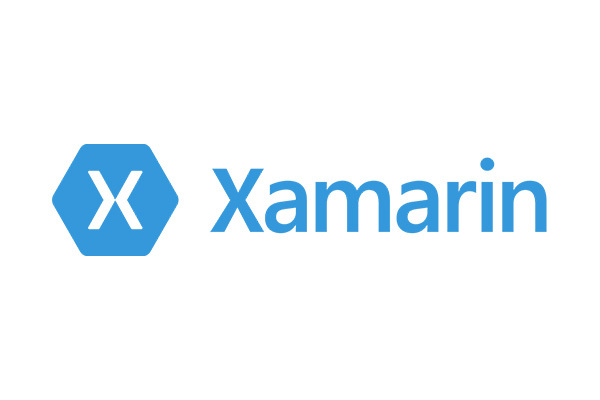 Xamarin the company was originally founded in 2011 by the engineers who developed Mono. Microsoft swooped in and acquired Xamarin in February, 2016. Now it operates in lock-step with Visual Studio as the preferred dev environment for mobile apps. As you would expect, Microsoft provides dazzlingly clear step-by-step tutorials on its newly acquired mobile app cross-platform development environment. “Once you've done the steps in Setup and install and Verify your Xamarin environment, this walkthrough shows you how to build a basic Xamarin app (shown below) with native UI layers. With native UI, shared code resides in a portable class library (PCL) and the individual platform projects contain the UI definitions. These steps create a Xamarin solution with native UI that contains a PCL for shared code and two added NuGet packages. In Visual Studio, create a new Blank App (Native Portable) solution and name it WeatherApp. You can find this template most easily by entering Native Portable into the search field. After clicking OK to create the solution, you’ll have a number of individual projects. This example that has you link to a weather app goes on to provide code snippets and excruciatingly detailed step-by-step guidance. This is one of the better spots to check with if you’re launching into the world of Xamarin coding. Certificate Pinning in Xamarin.Forms, by Alessandro Del Sole: "Securing communications between applications and services is extremely important, and mobile apps are no exception. Even if you use an encrypted channel based on HTTPS, you should never completely trust the identity of the target. For example, an attacker could easily discover the URL your application is pointing to, and put a fake certificate in the middle of the communication between an application and the server, thus intercepting the communication. This is extremely dangerous especially if the application handles sensitive data. In order to avoid this, a technique called certificate pinning can be used to dramatically reduce the risk of this kind of man-in-the-middle attack. This article describes how to implement certificate pinning in Xamarin.Forms, making your mobile apps more secure." Xamarin.Forms Problem “Could Not Connect to Debugger” Solution, by Munib Ch: "There are some issues traced in the Xamarin 15.2 release. One of the major issued faced by developers is a debugging error. This issue is faced by many of the developers who are new in this field. This issue was first faced in Visual Studio 2015. This issue is resolved by ReSharper but it is costly. So I will give you the simple solution for that issue." Xamarin.Forms—Working with Application Storage, by Delpin Susai Raj: "This article covers working with Application Storage to save app settings on the app in the Xamarin forms App. Xamarin.Forms code runs on multiple platforms -- each of which has its own filesystem. This means that reading and writing files are the most easily done tasks using native file APIs on each platform. Alternatively, embedded resources are also a simpler solution to distribute the data files with an app." Introduction to Xamarin Forms ReturnType Key, by Sumit Singh Sisodia: "Today, I would like to tell you about Entry Key ReturnType. I'll tell you how to change ReturnKeyType keys like Search, Done, Next etc. In this article I am using Xamarin Forms PORTABLE and XAML. In IOS: We have UITextField which has a ReturnKeyType property that you can set to a pre-assigned list. In Android: We have EntryEditText which has an ImeOptions property which helps in changing the EditText Key for Keyboard button. Why Choose Xamarin for Cross Platform Mobile Apps with Visual Studio? by Mukesh Kumar: "Nowadays, everyone wants to use mobile apps rather than websites because they are easy to use with your smartphones. But, do you think mobile apps development is easy? No. Mobile app development is not an easy task due to the availability of different platforms like iOS, Android, and Windows. When we create a website, it is accessible from any device from an Android phone to your laptop. But when you create an App, it is not always accessible from all platforms." “Xamarin with Visual Studio 2017—Build native cross-platform apps:"Along with the launch of Visual Studio 2017, Microsoft has released many fresh and exciting features for mobile developers to develop cross-platform mobile apps using Xamarin. Visual Studio 2017 will help you to build better native cross-platform apps in less time as compared to Visual Studio 2015." Xamarin Forms Fundamentals: "Xamarin Forms allows developers to build cross-platform mobile app using the common UI pages, layouts, views, controls, and design patterns. At runtime, each Xamarin Forms UI element will be mapped to its native equivalent element in each platform, so that truly native UI can be build and rendered." Understanding Xamarin Forms—Build Native Cross Platform Mobile Apps: "Xamarin Forms is a part of Xamarin family to build truly native apps for iOS, Android & Windows from a single and shared code base using C#. Xamarin.Forms offers the UI controls/views which you can use to develop UI. These UI controls/view at run-time are converted to platform-specific UI controls. Understanding Xamarin iOS—Build Native iOS App: Xamarin.iOS is a part of Xamarin family to build native iOS app with C# and Xamarin. Xamarin.iOS offers the same UI controls that are available in Objective-C or swift language and Xcode." Understanding Xamarin Android—Build Native Android App: "Xamarin.Android is a part of Xamarin family to build native Android app with C# and Xamarin. Xamarin.Android provides the same UI controls as you have in Android with Java. Understanding Xamarin—A Cross Platform Solution: Xamarin is a free open-source framework to build truly native cross-platform mobile apps using C# .NET for iOS, Android or Windows. It runs on Mono and .NET to build apps with native performance and native UI. 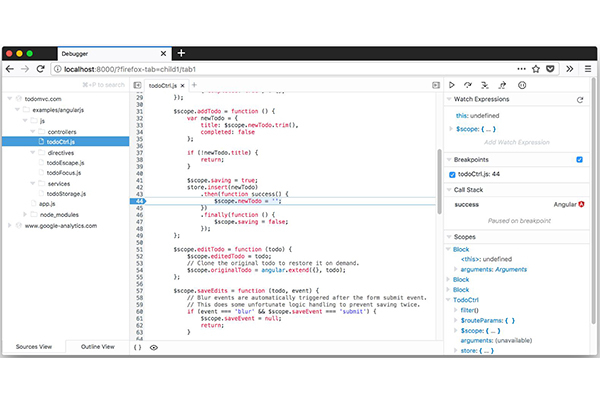 Xamarin allows you to develop native apps using C# language and platform specfic tools/SDKs and share the same code across multiple platforms like iOS, Android or Windows." Microservices design patterns are software design patterns that generates reusable autonomous services. The goal for developers using microservices is to accelerate application releases. By using microservices, developers can deploy each individual microservice independently, if desired. They have their strengths and drawbacks (thankfully more strengths) and there are many more examples of when they are appropriate to use than not. Here are some listings of top microservices and their use cases we found in the blog-iverse. This post is a nice fundamental rundown of some of the basic microservice design patterns. It’s a little older, but still germane. Post author Arun Gupta writes, "The main characteristics of a microservices-based application are defined in Microservices, Monoliths, and NoOps. They are functional decomposition or domain-driven design, well-defined interfaces, explicitly published interface, single responsibility principle, and potentially polyglot. Each service is fully autonomous and full-stack. Thus changing a service implementation has no impact to other services as they communicate using well-defined interfaces. There are several advantages of such an application, but it’s not a free lunch and requires a significant effort in NoOps." "Aggregator Microservice Design Pattern: The first, and probably the most common, is the aggregator microservice design pattern. In its simplest form, Aggregator would be a simple web page that invokes multiple services to achieve the functionality required by the application. Proxy Microservice Design Pattern: Proxy microservice design pattern is a variation of Aggregator. In this case, no aggregation needs to happen on the client but a different microservice may be invoked based upon the business need. Just like Aggregator, Proxy can scale independently on X-axis and Z-axis as well. You may like to do this where each individual service need not be exposed to the consumer and should instead go through an interface. Chained Microservice Design Pattern: Chained microservice design pattern produce a single consolidated response to the request. In this case, the request from the client is received by Service A, which is then communicating with Service B, which in turn may be communicating with Service C. All the services are likely using a synchronous HTTP request/response messaging. Branch Microservice Design Pattern: Branch microservice design pattern extends Aggregator design pattern and allows simultaneous response processing from two, likely mutually exclusive, chains of microservices. This pattern can also be used to call different chains, or a single chain, based upon the business needs. Shared Data Microservice Design Pattern: One of the design principles of microservice is autonomy. That means the service is full-stack and has control of all the components – UI, middleware, persistence, transaction. This allows the service to be polyglot, and use the right tool for the right job. For example, if a NoSQL data store can be used if that is more appropriate instead of jamming that data in a SQL database. Asynchronous Messaging Microservice Design Pattern: While REST design pattern is quite prevalent, and well understood, but it has the limitation of being synchronous, and thus blocking. Asynchrony can be achieved but that is done in an application specific way. Some microservice architectures may elect to use message queues instead of REST request/response because of that." He goes into greater detail in his post. Check it out if you’re looking for a good primer on microservices design patterns. 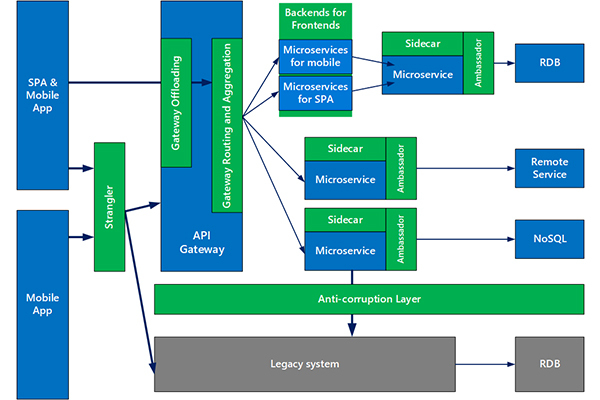 Naturally the Azure team at Microsoft has just published nine new microservices design patterns. Mike Wasson, lead content developer for AzureCAT patterns and practices, describes the new offerings from the Azure team in this recent post. Backends for Frontends creates separate backend services for different types of clients, such as desktop and mobile. That way, a single backend service doesn't need to handle the conflicting requirements of various client types. This pattern can help keep each microservice simple, by separating client-specific concerns. Strangler supports incremental migration by gradually replacing specific pieces of functionality with new services." Wasson concludes with his own take on the whys and hows of microservices design patterns. "The goal of microservices is to increase the velocity of application releases, by decomposing the application into small autonomous services that can be deployed independently. A microservices architecture also brings some challenges, and these patterns can help mitigate these challenges." Hey there everyone, Lafe here again. And once again, every month or so my fellow Visual Studio Live! blogger Rich Seeley will present a more technical approach to these blog posts. His latest post details some of the clamoring and confusion going on around C#, most notably that C# fans are being left out in the cold when it comes to AI. There's been plenty of news over on https://visualstudiomagazine.com/home.aspx. Some of the news has been about new features for C#. But one of the big stories is about C# coders being left out of Microsoft’s Artificial Intelligence game. In .NET Coders Clamor for C# Support in Microsoft's CNTK AI Toolkit David Ramel, editor of Visual Studio Magazine, uncovered unrest in posts on the Issues section of the Microsoft Cognitive Toolkit (CNTK) GitHub repository for the open source toolkit for commercial-grade distributed deep learning. While CNTK supports Python, the current AI darling, as well as BrainScript, .NET developers are wondering why more traditional .NET languages like C#, Visual Basic and F# are not included. Here's some of what Ramel found in posts on the GitHub site where a developer with the handle nikosdim1 wrote a post titled "C# and .NET support barking," highlighting the lack of C# support: "Strangely, though, it seems that we have to abandon C#/VB/F# and learn python because CNTK is more supported in this language (OK C++ too but this is not a 'clean' .net language) maybe because other frameworks rely more on Python." In the opinion of this poster it seems .NET developers are being told not to use C# or Visual Basic or F# because Microsoft doesn’t seem to fully support them. Another developer posted: "I'm eager to finally work with deep learning on Windows with C# instead of on Linux with Python." A poster who appeared to be with Microsoft tried to reassure the developers that support for C# and the other traditional languages is in the works but added there is no timeframe. Microsoft is famously closed mouthed about these issues. But when news breaks, you’ll find it on VisualStudiomagazine.com. Better news for C# developers is Microsoft’s commitment to speeding updates. In Microsoft Quickens C# Release Cadence, Unveils v7.1, Ramel told readers: "Mads Torgersen, lead designer for C#, said the team is moving to 'point releases' to keep up with associated tooling -- like Visual Studio -- and the underlying .NET Framework itself that are shipped more frequently. This, he said, brings new features to developers in a trickle so they can take advantage of them sooner." In January, Amazon Web Services also had good news for C# developers as reported in AWS Cloud Adds .NET Core 2.0 Support for C# Coding of Lambda Functions. AWS announced support for .NET developers using C# to write Lambda functions “while leveraging .NET Core 2.0 libraries.” Lambda is the foundation of Amazon's “serverless computing” service. To learn more about the latest features in C#, read this Visual Studio magazine article about a presentation at a recent Visual Studio Live! conference with Microsoft's Adam Tuliper. C# developers with an interest in tuples will find a lot here. It's the next best thing to attending Visual Studio Live! where you would have actually had a chance to chat with Tuliper, as is the case with all of our presenters. If you are really looking for a deep dive into C#, go to Analysing C# code on GitHub with BigQuery by London-based Microsoft MVP Matt Warren. As he explains: "...in this post I am going to be looking at all the C# source code on GitHub and what we can find out from it." He found answers to both controversial and more prosaic C# questions ranging from "Tabs or Spaces?" to "How many lines of code (LOC) are in a typical C# file?" 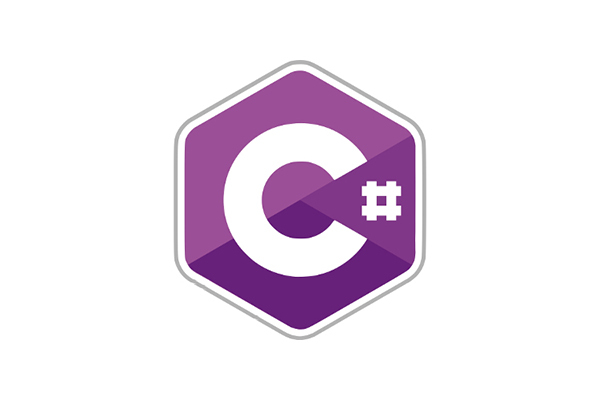 If you're curious about all things C# this is a great read. For those who want to get involved, the Design Team suggests: "If you discover bugs or deficiencies in the above, please leave an issue to raise them, or even better: a pull request to fix them." Finally, here's a question where there doesn't seem to be an answer. C# predates Twitter with its famous hashtags. But in the 21st century wouldn’t it be easier to rename the language Csharp since that's what you have to do when you post to Twitter or create a URL on the web? In this corner, we have waterfall. Long the champion of the sequential approach through the typical development phases such as design, development, testing, deployment, and maintenance. Developers work through each phase in order, like a "waterfall" cascading down over the rocks. And in this corner, we have agile. Sometimes you'll see it as big Agile with a capital A, other times as little agile with a lowercase a. Agile is certainly a livelier approach, taking an adaptive and flexible role in the planning, development, delivery, and continuous updating stages. Instead of doing one phase at a time, teams work on all phases, all the time. So is it one or the other? Should you use the older waterfall approach or the more adaptive agile approach? As you’ll see from some of the expert analysis we've gleaned from the blogosphere, the prevailing attitudes and preferences lean heavily toward agile. But do organizations really take into account all of these factors? What, or who, actually decides a process? Possibly the main thing that influences a chosen methodology is existing processes. Your organization’s current processes are likely to determine how you run your project—whatever that project is. It’s the classic one-size-fits-all approach. Given that each project has different needs, and can differ quite widely in influencing factors, this isn’t the best way to run every project at your organization." At this point, Haworth admits she has been sitting on the fence, but then she does have to agree agile is better suited for modern digital projects. "Both methodologies...have benefits in their own right. But if we're living in an ideal world, the Agile approach does suit pure digital projects more. All the principles do seem to fit the digital landscape, where evolving needs and change are present throughout all projects." There you have it. "Traditional waterfall treats analysis, design, coding, and testing as discrete phases in a software project. This worked ok when the cost of change was high. But now that it's low it hurts us in a couple of ways. Poor quality: First off, when the project starts to run out of time and money, testing is the only phase left. This means good projects are forced to cut testing short and quality suffers. Poor visibility: Secondly, because working software isn't produced until the end of the project, you never really know where you are on a Waterfall project. That last 20 percent of the project always seems to take 80 percent of the time. Too risky: Thirdly you've got schedule risk because you never know if you are going to make it until the end. You've got technical risk because you don't actually get to test your design or architecture until late in the project. And you've got product risk because don't even know if you are building the right until it's too late to make any changes. Can't handle change: And finally, most importantly, it's just not a great way for handling change. Quality improves because testing starts from day one. Visibility improves because you are 1/2 way through the project when you have built 1/2 the features. Customers are happy because they can make changes without paying exorbitant costs." Clearly, Agile Nutshell is a fan of agile over waterfall, and with that compelling argument it's difficult to disagree. 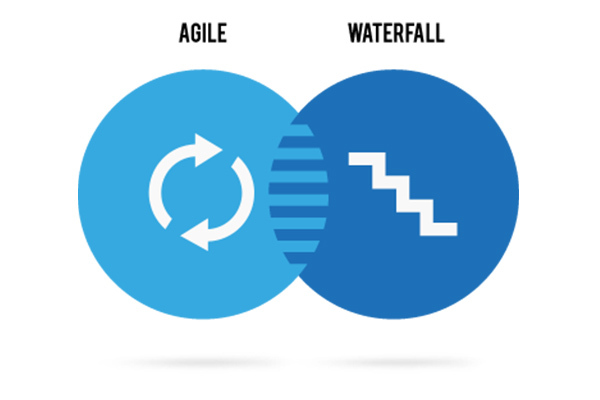 Agile versus Waterfall: approach is right for my ERP project? "Have you ever wondered how to deliver your project quicker and realize business value sooner from your ERP implementations? Have you ever wondered how to remove all of the "ceremony" of the implementation process and the "waste" involved with an ERP implementation while preserving the integrity of the delivered ERP package methodology? Have you ever wondered if there was a way to be flexible enough during ERP implementations, and that changing business requirements could be provided to a project team mid-implementation, without significantly affecting the overall cost and schedule? Have you ever wondered how to improve the efficiency and productivity of your existing ERP teams by doing 'more with less' in today's economy? These are common questions that are asked when discussing how to improve the implementation of ERP projects. 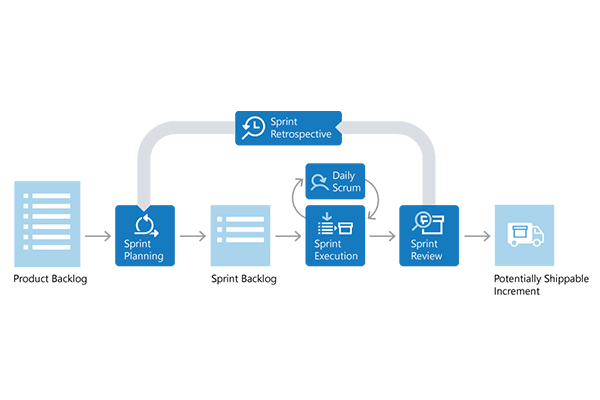 Consideration of Lean concepts and agile techniques to accelerate the time to delivery and the realization of benefits is becoming more prevalent. Project managers are challenging the ways they have been traditionally implementing projects and are seeking new approaches. However, there are many considerations in determining the right approach." Check out the full presentation, in which the authors discuss the key determining factors to consider when deciding whether a particular project is better suited for agile or waterfall.